Prints ship for FREE in the USA and $10 worldwide. 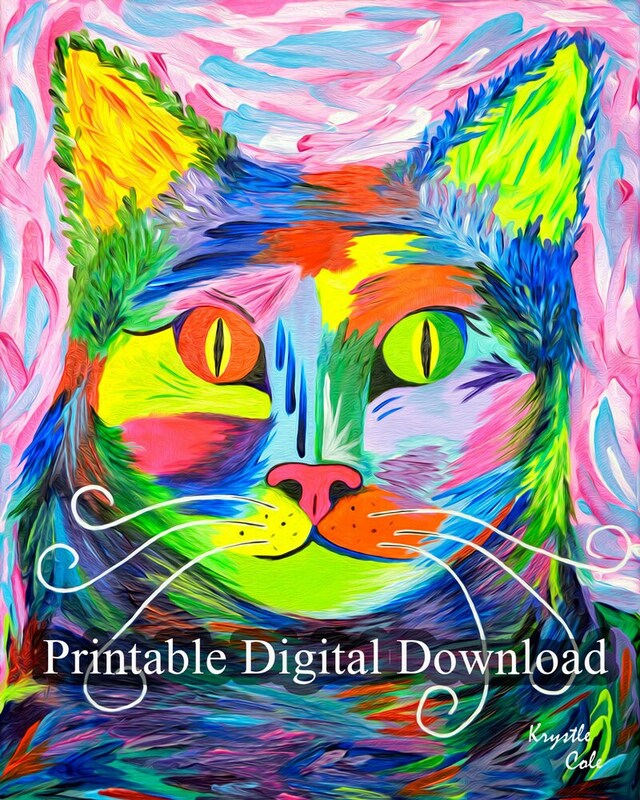 This colorful cat would be a purr-fect gift or purchase for anyone who likes cats, artistic cat pictures, or abstract cat art. This is a DIGITAL download item, NO PHYSICAL item will be shipped. The files will be delivered electronically within minutes of your order and payment. An email will be sent to you with a link for your download. PLEASE NOTE: This file is for personal use only, not for resale. It may be printed up to 5 times. This image is under copyright by Krystle Cole. ➤ Print at home using good quality fine art paper or photo-paper. ➤ Print at your local copy shop. ➤ Upload to an online print shop such as staples. • This is a digital item, you will not receive anything in the mail. • The colors may vary from monitor to monitor and printer to printer. © 2014-present by Krystle Cole. By purchasing and downloading this file, you agree to use it only for your own personal use and not to sell prints made from it, share the files to anyone else, or upload the files to an image sharing website. You may print the image up to five times. All rights to this artwork remain the property of Krystle Cole, Artist. Please get in touch, I'm happy to try to resolve any question or issues for you. To fulfill your order, you must provide certain information, such as your name, email address, postal address, payment information, and the details of the product that you’re ordering. You may also choose to provide additional personal information (for a custom painting order, for example). If you enter your mailing address when ordering, your name, email, and mailing address will be shared with Etsy and either Fedex or USPS. Compliance with laws. Your information may be collected, used, retained, and shared if there is a good faith belief that it is reasonably necessary to: (a) respond to legal process or to government requests; (b) enforce my agreements, terms and policies; (c) prevent, investigate, and address fraud and other illegal activity, security, or technical issues; or (d) protect the rights, property, and safety of customers, or others. If you have an account, you can request to receive an exported file of the personal data we hold about you, including any data you have provided to us. You can also request that we erase any personal data we hold about you. This does not include any data we are obliged to keep for administrative, legal, or security purposes. Please contact krystle@krystlecole.com for privacy-specific concerns. I package my fine art prints in clear archival poly bags. Then, depending on the size, I either ship the print rolled securely in a tube or laying flat in a bubble pack envelope with rigid mat board supports. All orders are insured and will be replaced if damaged during shipping (but this rarely happens!). I package my original paintings with extra care. Each painting is wrapped in wax paper, then a layer of foam wrap. After which, it is sandwiched between two sheets of cardboard and secured with tape. This cardboard/painting packet is then wrapped with bubble wrap. It is placed in a heavy duty cardboard box that has at least 2 inches of space around the painting where I add more bubble wrap and/or bubble bags. All orders are insured. I've shipped all over the world and never had a painting damaged in transit (knock on wood! ), but if it were to happen, I could paint another similar piece to replace it or refund the order total. I make each print as it is purchased. So, if you need a print with specific dimensions that I don't offer in my listings, I'm happy to provide a custom print that will fit your frame or wall space. Please message me to order. Prices will vary depending on size.